As you know, I write a Resident Recipe column in our monthly neighborhood magazine. The magazine is quite impressive for a neighborhood publication and includes 70 full-color pages each month! 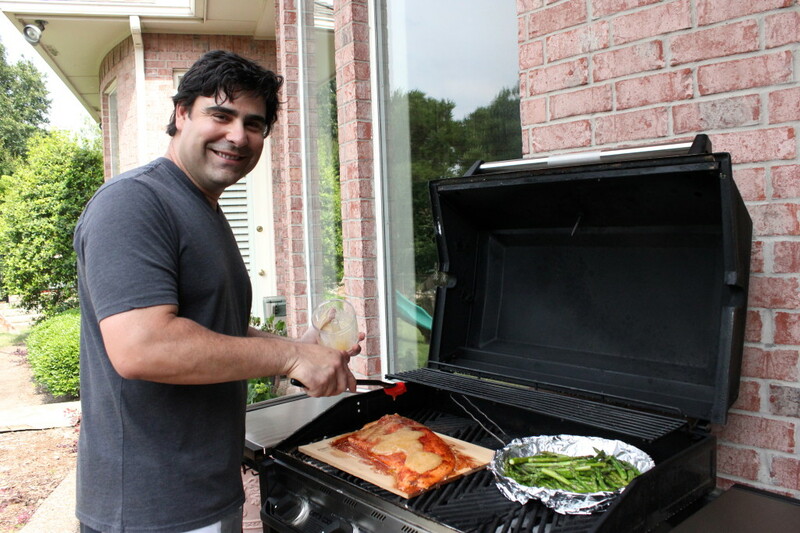 For the month of July, I interviewed Joseph, his wife Shawna and their four kids as they shared with me one of their favorite recipes for the grill: Cedar Planked Salmon. One great thing about being the resident recipe columnist is that I get to taste all of the food featured in our magazine! The family was gracious enough to let me try the salmon, and I can say with all honesty that it was was outstanding! Matt wasn’t with me at the time, so with as much willpower as I could generate, I saved him a small piece to try when I got home. The salmon hits the grill! Brushed with olive oil and seasoned with John Henry’s summer peach rub and raspberry chipotle rub. Summer is here, which means it’s time to heat up the grill for some backyard barbecuing, and neighborhood resident Joseph knows how to grill an incredible cedar planked salmon that would make any meat eater enjoy fish!! While Joseph is a red meat lover himself, he says they key to seafood is to “make it not taste like fish.” Using his father’s recipe, Joseph has perfected his cedar plank salmon so that even his kids love it. In a matter of minutes, the family of six can devour an entire filet (or two of salmon) in just one dinner. Enjoy! Joseph adds the peach, apricot and pineapple glaze during the last 10 minutes of cook time. Check out that nice caramelized glaze! Serve with grilled asparagus for a well-rounded meal. 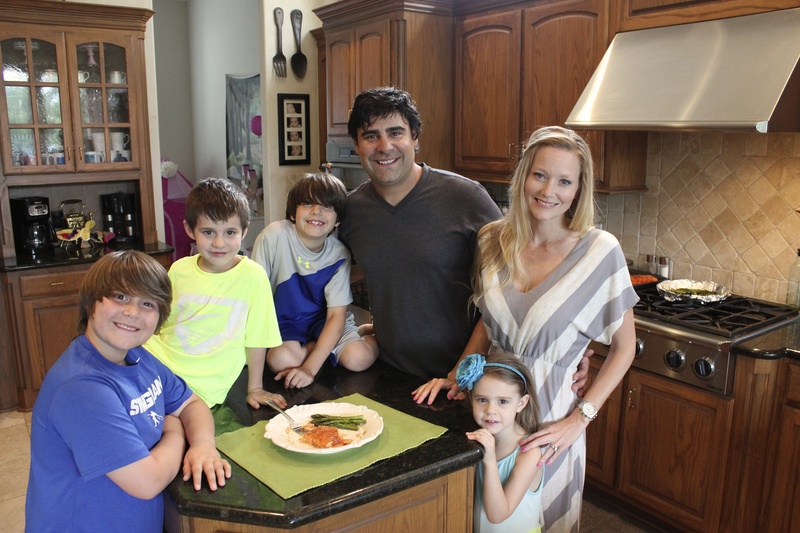 Joseph, his wife Shawna and their four kids… ready to all dig in! Rub a generous amount of olive oil all over the front and back of the salmon filet. Place salmon in a glass dish. Place salmon in a glass dish and generously sprinkle over salmon a 2:1 ratio of John Henry’s summer peach to raspberry chipotle rub. Make sure to use enough rub so it can caramelize on the grill. 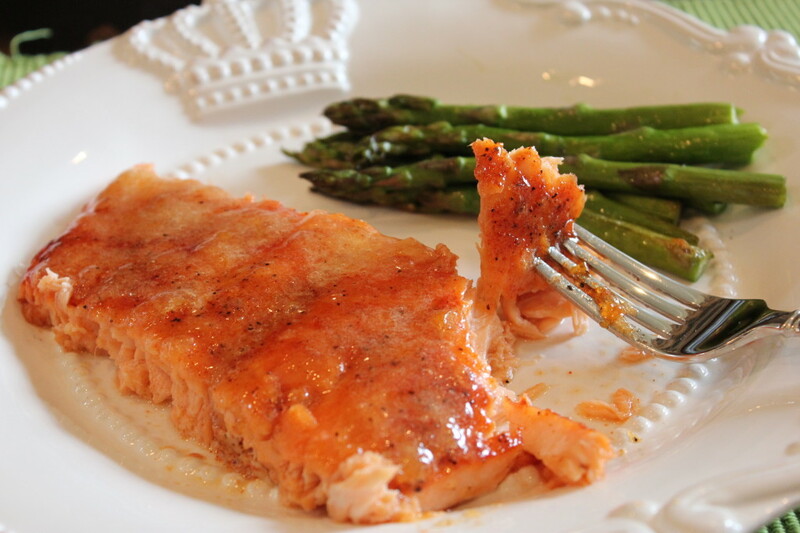 Place salmon in the refrigerator for 2-3 hours to marinate. Preheat grill to 275 degrees F. Do NOT let the grill get hotter than 300 degrees F or you risk drying out the salmon. Place salmon on a cedar grilling plate and grill it for 25-30 minutes, or until done. Depending on how large your salmon filet is, the cook time may be shorter or longer. FOR THE GLAZE: 10 minutes before the salmon is ready, combine about 1-2 tablespoons each of apricot, peach and pineapple preserves in a food processor. Combine until well blended. Pour the combined preserves over salmon and continuing grilling for 10 more minutes or until salmon flakes easily with a fork. *John Henry’s rub can be purchased at Barbeques Galore, Elliott’s Hardware or online. 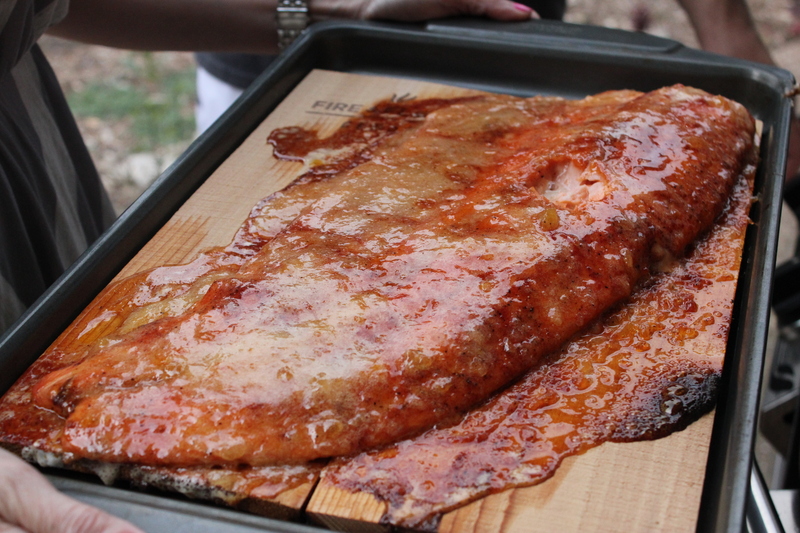 A cedar grilling plank can be purchased at Kroger or just about any grocery store. 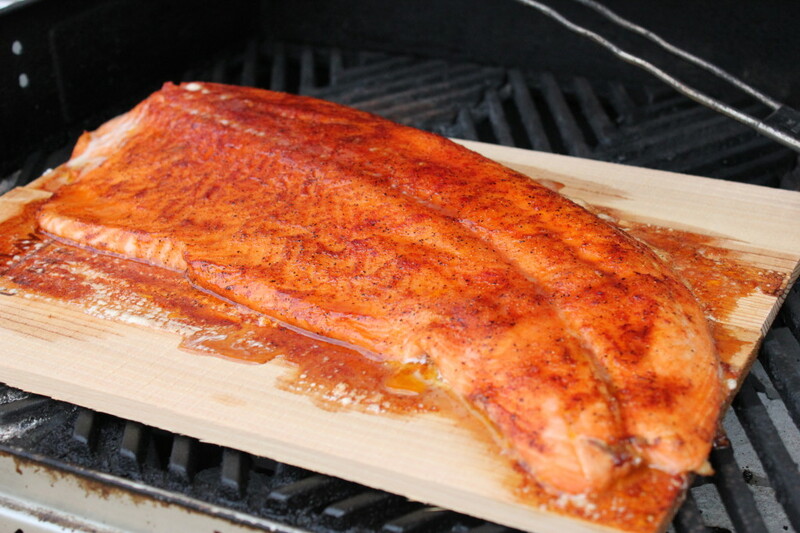 5 Responses to "Cedar Planked Salmon"
Love the look of that peach rub! Hope you enjoyed those Fire & Flavor grilling planks.